so my grandpa is sick. papa. my papa. if i'm honest with myself he's dying- though he certainly won't admit it- and there's nothing i can do about it. my mom called to tell me how bad it was last tuesday and ever since i haven't been able to sleep. he's lived a long and healthy life but he's suffering so much right now that this is hard. when i'm awake i want to be doing something but i realize nothing is going to fix this; so i cook and clean for nana and bake for my mom and make earrings and blankets. brandon says it's that gift of hospitality in me that can't sit still when there's a need to be met. 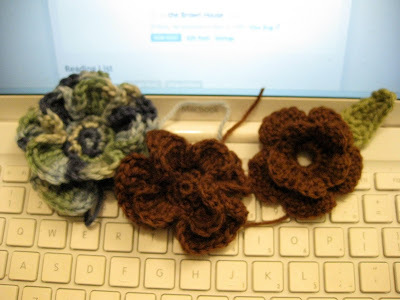 sooo tonight as i sit here trying not to think about the inevitable i decided to experiment with some yarn and crochet a few flowers. i envision these in the shop one day as pins. or on a pillow? or purse? we'll see. forgive the horrible photo. this is what happens after 3 hours of crocheting while watching high school musical 3. ugh. time for bed. on a happier note there are new earrings in the shop and i just got this book to help me play with my new sewing machine! Through the amazing women at Craft Hope money is being raised for Haiti. They have set up an etsy shop where all the items for sale are donated and all the proceeds (including shipping costs) go to Doctors Without Borders. I donated a pair of earrings and I'm waiting to see where to ship them because they were sold within a few hours of being posted! It's a fun way to feel like I've done my small part. The shop itself has done great!! Itopened on January 15th and by yesterday over 1000 items had been sold for over $20,000!! They are no longer accepting donated items but PLEASE head on over to the shop and buy handmade for Haiti!